Is the mission of Jesus about making clean-cut, polite, nice, honest, law-abiding, friendly, ethical people out of us? Is Christianity, when you get right down to it, just about obeying the “Christian rules” and ethical guidelines for life, instead of whatever former ethical standards we had before becoming Christians? But that does not mean that our faith in Jesus is without ethical implications. In fact, it is obvious that there are behaviors and ethics that are definitely un-Christian. (2) How do people who claim to be in relationship with the God of the Bible demonstrate what their God is like by the way they live? In other words – ETHICS are about THEOLOGY (God) and MISSION (witnessing). They are not really about salvation. So ethics are not the rules to obey in order to become Christians. Ethics are about the way the “saved people” live inside the world while the un-believing world watches them live. In his book “The Mission of God’s People” author Christopher Wright notes that in both Old and New Testaments, God’s people are to be known as (1) The People Who Represent God to the World, and (2) The People Who Attract the World to God. Biblically speaking, it is impossible. Witnessing is more like: “God has changed my life, and is being reflected in my actions, lifestyle, relationships, and conduct in the world – therefore, submit your life to him as I have, and he will change you too” (Mat. 28:18-20). This is the challenge, and the ethical side of witnessing! Okay – your turn. Do you see the relationship (if any) between ethics and witnessing? Jump in to the comments below and be part of the dialogue. Interesting post, Kenny. Lots to think about. 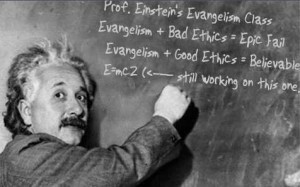 A few years ago Scot McKnight posted something regarding ethics and evangelism from the perspective of how sometimes people go door to do a “poll” with the intention of leading people to Christ. I can’t remember the exact nature of that conversation but it got me thinking a lot about some of the missionary methods that I have either heard about, read about, or experienced! I’m very concerned about doing evangelism if we’re also breaking ethical codes… and lying is one of them that I get uncomfortable. But anyone who has done missions work in countries or locations that are in opposition to the missional work knows that situations arise where being truthful about intentions or goals can be difficult. Part of my inspiration for this post was the perspective that witnessing is where we go out and share some “Salvation Formula” with people, then ask them if they want to “accept” it so that they can go to heaven. Such an approach doesn’t seem to capture the meaning of martureo at all. However, a life that is transformed seems to be the best evidence of God’s work in us. “Ye shall be my witnesses” is not, in my view, going around sharing “the plan of salvation’ with people, and asking them to sign up. Rather, it seems more to be about going around and showing God’s power to change us, and inviting people to change the whole way they think about everything, and follow the King. I like Wright’s central emphasis on theology (not theological precepts, but “What God is like) as the first aspect of witness. Ethics is a way of expressing God’s true identity. Anyway – I also have a problem with the door-to-door survey approach. I have heard of that too, and it seems completely different from what scripture is telling us about witness.